While I might have been worried about whether I would be able to concentrate on writing during my daily commute, I needn't have been. No sooner had I taken my seat than we were arriving into the station a good 500 words written, the time passing in a blur. I found writing on my laptop with an internet connection far more difficult than using my ipad. It turns out there are far too many temptations even if it's merely a google search for 'opium pipes in Paris, 1880s'. I already knew this really. When I was writing my Masters Dissertation I would roll out of bed in my pjs, make a quick cup of tea and start working. My concentration levels are usually at their best first thing and it was no different during November when the bulk of my writing was done before work and on my morning commute. 1000 words before breakfast anyone? 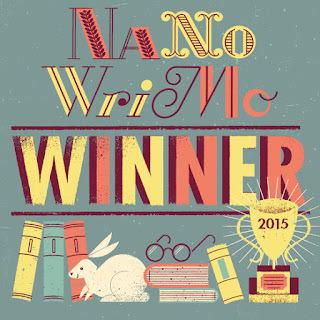 Whether it was my RL friends on Facebook, the many fellow Nanowrimo-ers on Twitter, or even the woman sitting next to me on the train, people were really enthusiastic and supportive of this challenge. It was such a huge undertaking with everything else going on in my life that this support was incredibly important in pushing me towards my target. I've already mentioned how difficult I found writing on my laptop but another reason for this is the MS word count. I discovered that I write more easily when I don't have my eye on that pesky little tally at the bottom of the page. I tried to save my word counts until the end of each day when I had finished writing. I started the first week of NaNoWriMo with amazing motivation and brimming with ideas. The week passed in a haze of writing, work, writing, bed, writing, work, writing, bed etc. and I was feeling pretty smug about how easy it was proving. I learned to embrace these days and to write as much as I could when I felt that way. Yes, you guessed it, the creative burst of week one seemed to flail a bit during week two and let's not even talk about week four. I learned that sometimes it was better to acknowledge my own lack of mental capacity for writing and leave it for another day. During week four I fell ill with a bug which knocked me sideways and even led me to take an unheard of day off work. I was pretty much useless for three days as a consequence and boy did I beat myself up about it. I felt worse that I wasn't able to write, particularly with the finish line in sight. The best thing I could do was to take a step back and refocus when I was feeling better. Taking on the challenge of writing a book in a month meant an understandable increased pressure on my time. Where I would usually enjoy a half hour with my book in the morning and more reading on the train I got to the point where I'd barely read for pleasure for the entire month of November. If I ever do this again I think I'll have to find a better balance as I missed reading too much. That obsessive absorption in your own ideas is addictive and I had not realised how much I had been missing it. Taking part in NaNoWriMo has shown me that I am more than capable of finding the time for this endeavour and I hope it marks the start of a new dedication to my own written work.